Planning a dinner party menu can be somewhat of a challenge at the best of times. Partner your menu planning with post-holiday self-flagellation and nutritional denial and you've now tasked yourself with the near-impossible....finding a semi-elegant meal that is obnoxiously in-your-face healthy, yet also bears more resemblance to food than it does to all-bran. It seemed rather obvious to me that dinner should start with a salad. 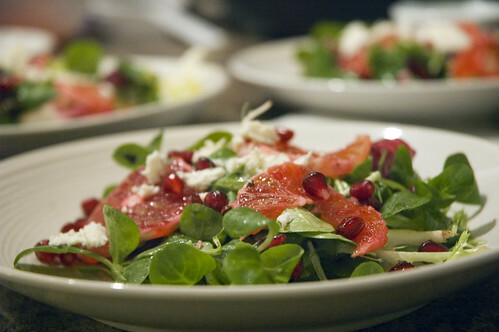 I did a repeat of a salad I made a few weeks ago - one with pomegranate, blood orange and a bite of soft cheese. The colours are wonderful together, the flavour is fresh and just a bit pungent and I made a light citrus dressing to accompany. I could perhaps have made more of an effort to find a lower fat recipe, but low fat dressing always tastes awful. I used about 1/2 c olive oil, 1/4 c lemon juice, 2 T orange juice, 2 T dijon mustard, sea salt and pepper....and it made about six times the dressing I actually used. Hopefully I'll find a use for the rest sometime this week. I topped the salad with a little bit of crumbled herb and garlic boursin cheese. You know it's bad for you when a cheese gets 100 % of it's calories from fat. Anyway, I probably used just over 1 teaspoon per salad and it added an amazing dimension. Total yum. So this lead me to the unlikely combination of green peas and ravioli. I was inspired by a recipe on epicurious and it turned out to be one of the best surprise dinner party discoveries yet. I really wanted to include a pasta course, but past attempts at this inclusion proved rather unwieldy. Not being of Italian descent, neither myself nor most of my acquaintances are accustomed to the idea of pasta as "primo" (or first course) rather than as the main attraction. In order to overcome this carb-laden obstacle, I wanted to come up with a way to serve a small amount of pasta that would at once satisfy and tantalize the appetite. I didn't want piles of spaghetti, I didn't want slabs of lasagna - I wanted something delicate. And green pea ravioli was PERFECT. As always, I couldn't follow the recipe (cuz I'm seemingly incapable of following simple instructions...) - I don't have a food mill (seriously, does anyone????) and since my food processor is on the fritz, I didn't actually manage to get a perfectly smooth pea purée. My food processor now needs to be physically held down to actually function, and I'm thinking this maybe isn't the safest appliance to be using due to this not insignificant issue. I did get the peas finely chopped, and mixed up the filling, with the only other substitution being seasoned dry bread crumbs instead of unseasoned. 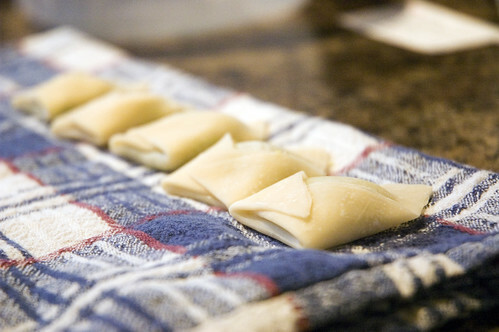 I was also a bit skeptical regarding the use of wonton wrappers in lieu of actual pasta (I'd seen it before in recipes, but was dubious as to what the results would be....turns out it's a great substitution for those of us who have neither the time nor the inkling nor the equipment to make our own pasta). Here is a shot of the ravioli in progress (I'll have to thank my fab mother-in-law for helping me get it all put together - they look like little mitres (or bishop's hats). Too cute! And they were very easy to whip up. If anyone else is looking to impress with a homemade pasta course, these were a cinch, looked awesome, and tasted great. I think one or two of them may have exploded during cooking, but the little pea bits just made the finished product all the more colourful. The lemon garlic broth (I halved the amount of broth suggested) was a nice light accompaniment. I would also make this broth for any pasta dish where you just want something delicate yet flavourful. Two thumbs waaaaay up for this recipe. Encouraged by this success, I can now foresee pseudo-homemade pasta making a regular appearance in the dinner party rotation. Main course was a shrimp dish that I've made several times before as well....the ingredients are simple, but the flavours are just gorgeous. The white wine is a MUST in the sauce, as is some good fresh basil. If you have seafood lovers coming over, I highly recommend trying this out - it's simple to make, cooks up quickly and has just enough broth that would be great to soak up with a lovely baguette. Not that I had one (no refined carbs and all that). 1. Heat olive oil in a large skillet. Add garlic, red onion, zucchini, squash and mushrooms. Cook for about 5 minutes (veggies should soften a bit). 2. Add tomatoes, white wine, balsamic vinegar and oregano. Simmer, uncovered for about 10 minutes (until a lot of the liquid is gone). Season with salt and pepper. 3. Add shrimp and basil and cook for about 4 minutes or until shrimp turn pink and opaque. 4. 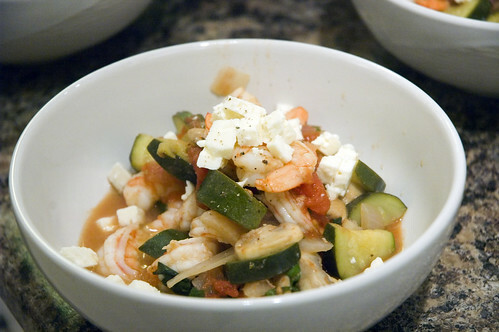 Serve with feta sprinkled on top (pasta is optional – I prefer it without pasta). I normally like my veggies a little crunchier than the above pic, but hubs is not keen on nearly-raw veggies (such a shame). This dish was very well-received. I will often use twice as much garlic (or more) and usually toss nearly half a bottle of chardonnay into the mix (we're not big white drinkers, so no one mourns the loss). Dessert was a bit of a challenge. I wanted to maintain the healthy theme, but I didn't want to go with something more boring/classic like fruit parfait or something similar. I wanted something snazzy, but not too complicated....and still not ridiculously decadent. I asked my fellow chow hounds on www.chowhound.com (great site!) and the idea of Pavlova was suggested. I have to confess that my acquaintance with Pavlova was limited to the episode of Take Home Chef where Curtis picks up the skinny fellow expat and they talk about Pav-loooow-va in the coolest Australian accent ever. So I made my own version of individual pavlovas. 2. Line large rimmed baking sheet with parchment paper. Using electric mixer (MAN I wish I had a stand mixer! ), beat egg whites in a large bowl until soft peaks form. 3. Gradually add 1 cup sugar; beat mixture until thick and resembles marshmallow creme (about 5 minutes). 4. Beat in cornstarch and vanilla extract. 5. 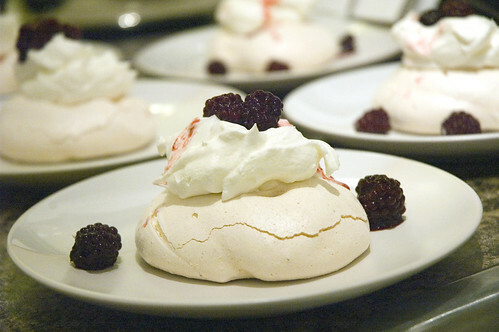 Drop meringue onto prepared sheet in six mounds, spacing apart. Using a spoon, make indentations in the centre of each. 6. Place in oven; immediately reduce temperature to 250F. 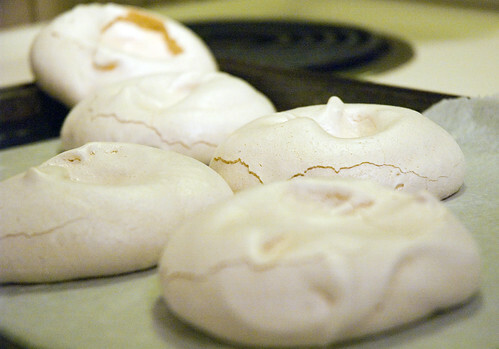 Bake until meringues are dry outside but centres are still soft (abou 45 minutes). Cool on sheet on rack 30 minutes. Normally, pavlova would be made with unsweetened whipped cream. But due to the high fat content of said cream, as well as the north american distaste for unsweetened dairy (mine included - yuck! ), I totally crapped out and used 95% fat free cool whip. I know, I know, it's an edible oil product (which, for some reason, sounds SO gross when you talk about it....but olive oil is edible, corn oil is edible....it's not like we're talking black gold here or anything). I added blackberries on top (courtesy of Europe's Best) and just drizzled some of the juice over. It was colourful, crunchy, tasty and just overall, a great finish to the meal. So of course, after expending all that effort....I proceeded to go out for Thai tonight. Overall though, I've had a pretty good week - minimal alcohol consumption (3-4 units....), and relatively healthy food. I'm down 3.5 pounds and I haven't eaten any garbage all week. Woohoo!!!!!! HOLY!!! Does that ever sound fabulous! I love your blog so much. And, I really enjoy the pictures...thanks for working so hard to make the food, include the recipes, and take the pictures and load them...much appreciated. Lovely! Incidentally, proper ravioli are very easy to make (see hre: http://mamlambo.livejournal.com/4764.html - I make them often but havent posted pics yet boo). Thing to remember is to make 'em small as they really expand in cooking, so use a v big pot. A ravioli cutter makes life easier, but if you're patient you can do it with a cookie cutter too. Ravioli cutters are apparently unknown in England, so mum gave me hers when I visited. You can vary the fillings as much as you like... minced meat, ricotta, blue cheese and walnuts, ricotta and spinach etc etc etc. Everything looks amazing, and I am craving pavs now. I also have leftover wonton wrappers in my fridge from some Christmas appetizer that I made. Finally I have something to make with them! Thank you so much, we love trying your recipes. I have fun writing it and I'm learning (slowly) how to take good pictures, so it's a work-in-progress. Thanks again! :) Comments TOTALLY make my day. I want to try the ravioli recipe, but wondered what the difference was between regular peas and baby peas - which they call for in the recipe? Do you think that it would make a big difference if I used frozen pies? Hey Leslie - Just wanted to say that I tried out your recipe tonight and it was delicious! I never thought that it would be so easy to do. Thanks again for posting this! 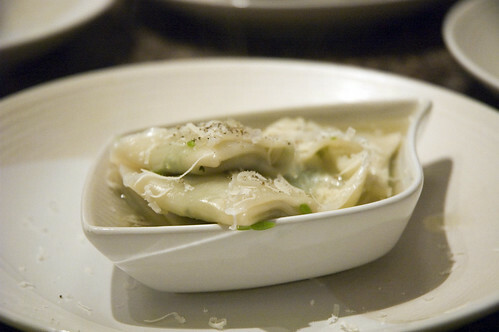 Mmmm... who would have thought pea ravioli would sound and look so good!! I'm not nearly as talented as you appear to be in the kitchen but your blog is inspiring!! HOLY KITCHEN are you ever amazing! I've seriously never seen food like that in my life, other than in magazines.